There are many devotees who seek spiritual guidance through email messages. Some problems are quite tricky in the sense that they are not easily given to satisfactory solutions. Many of the doubts arise, in some cases, due to their inability to understand what their Gurus have instructed. That is why it is always better to keep in the habit of studying the Gospel of Sri Ramakrishna, books on Holy Mother and Swamiji so that our minds are freed from doubts, further strengthened and fortified with renewed enthusiasm. One lady devotee wrote to me the other day that her in-laws and husband maintain antipathy to everything connected with the Ramakrishna sangha and their attitude actually hurts her in such a bad way that she was unable even to make visits to Belur Math. She said that “ …Whatever they are, they are not my problem. Almost four years ago very luckily I’ve got mantra from Sri Sri Swami Gahanananda Maharajji; before having any children I didn’t have any problem to manage time for japa and dhyana. But now the situation is that I’m a mother of two little kids – one is three and half year old and the other is one and half year old. Yes, one side unsupportive family and the other side the pressing need to take care of the family. Finding not much time, though they are earnest, and with the ever-present criticism against such spiritual practices, they feel despondent. Those devotees who have got this type of situation go through silent sufferings as their conscience prick them in what they consider as ‘neglect’ of their spiritual responsibilities. The following was my reply to this devotee A. …..Though it is unfortunate to learn that the related in-laws’ mental vibrations are not aligning with yours specially with regard to our Thakur, Ma and Swamiji, I dont consider that as an ‘obstruction’ to your spiritual life. Only Master knows why you have stepped into ‘their’ family. It is a two-way learning process : for you to become more intensified i.e., strongly resolved in spite of indifference and to them : to become more aware of your ‘bhakti’ as an example. I am happy that you however, are not unduly disturbed by that and you are carrying your sadhana with full faith. By Sri Thakur’s grace you have obtained a wonderful Guru in Srimat Swami Gahnanandaji Maharaj. You might have read in my blog my memories about the abiding guidance that I personally received from him. So, I consider you as most fortunate. Coming to your specific problem of feeling guilty over not being able to follow Guru’s instructions, I have to say that your feeling is misplaced. Revered Maharaj used to tell all his disciples after initiation that they should try to always be aware of the presence of Sri Ramakrishna in their hearts and repeat the mantra mentally while doing their works as far as possible. In many cases, while replying to questions of persons in situation of predicament, Revered Maharaj used to instruct them to get up a little early, before the hassles of daily life start, to do their japam. When there is no separate space for worship, even on the bed after putting a clean bedcover. Many people do not get free time in the evening. In their cases Revered Maharaj used to prescribe the time before bed when one had finished all his/her daily responsibilities. I think A…, you are following Guru’s advice only but unknowingly. After all, it is said that a Guru looks after his disciple’s welfare and guides him/her even when he is not physically present. I am sure by His grace your doubts would be dispelled. Continue doing your japa before going to bed at night and before leaving the bed at morning. Yes, Try to make it regularly. And during daytime work, continue with your mental japa. My prayers are with you. I have no doubt that Sri Sri Thakur is ever gracious in taking you by his hand in your spiritual path…..
E counselling is one of the important tool for spreading Teachings and Message of Thakur, Maa and Swamiji. To be very honest, that publication of such mails (of course without mentioning the name!!) can help many other Devotees. As already conveyed to you I am taking liberty to publish link to VEDANTA IN PRACTICE in our esteemed group of DEVOTEES OF HOLY TRIO. Yes, you are right. The challenges faced by individuals are mostly unique in that each one has such a divergent type of nature. Yet, there are many situations especially the doubts arising in minds, that can be considered common and solutions too could be common. Thats why I thought I shall provide only those points of discussion by email, relevant to devotees in general. Of course I shall not mention the names to keep up the confidentiality. You are most welcome and at liberty (is this not your birthright?) to give the reference of this blog anywhere. Hope you have read the Copyright license mentioned in the blog. Nothing fearful! nothing intimidating! And my thanks for popularising this blog through your Group website. May your enthusiasm in E-spiritual matters get encouraged at all level! The wisdom this habit bestows upon us cannot be explained unless felt. Revered Swami Chetananandaji Maharaj says that how M shared the God Intoxication with others! May Master ever inspire you! Trial and Time gives guidelines to many disciples who are not finding that much time to practise Japa and dhyana after days’ busy schedule. Frankly speaking, I am also not finding that much time to practise Japa. In this connection, I express my gratitude to you for inspiring me to take diksha from Revered Swami Atmasthanandaji Maharaj who, on a query from one of his prospective disciples on paucity of time for practice, answered in the same line as you gave in Trial and Time. In one evening, in the prayer hall of Ramakrishna Mission, Tupudana, Ranchi you were delivering some spiritual lectures. You said `May God bless those who have come to this prayer hall early.’ As I was a late comer after a hectic day, I wondered `Am I not covered?’ I don’t know how you could read my mind from out of many disciples sitting in the hall. You continued `May the blessing of Lord Sri Ramakrishna also be poured on those who have come late’. Happy to see your visit to this blog and comments! Yes, I do remember that particular occasion. And I do also remember, when we met first, that you got introduced to me as an ‘ex-student’ of our Narendrapur centre. And it was all so quick that within months you, your wife and children became so close to our Ashram. Thakur knows exactly when any one to be made a devotee and if at all anything that I could do, that was only as an instrument in His hands. May Master bless you all! My prostrations to Master, Holy Mother, Swamiji, and revered Maharaj. My loving pranam to you Maharaj! After reading your latest post, I cannot but agree with you totally about reading this powerful book, The Gospel of Sri Ramakrishna. It is most amazing how when personally I had many doubts and they were removed by Master and Swamiji through this most glorious book. It is a huge reservoir of the Master’s grace. May the Master’s grace eternally flow and fill our hearts with bliss! The glory of the Gospel of Sri Ramakrishna cannot be ever contained in a few words. I just want you to go through patiently the following article appeared in the Winter 2001 issue of Global Vedanta. The author of this below given article is Revered Swami Bhaskaranandaji Maharaj who is the Minister-in-Charge of the Vedanta Society of Western Washington, USA. May Master inspire you always through this wonderful book! Nevertheless, the friend insisted that what he had told me was quite true, and that how the Ramakrishna Mission happened to be in Brazil without the knowledge of the Ramakrishna Mission in India was nothing short of a miracle. The miracle took place in the city of Belo Horizonte, capital of the mineral-rich state of Minas Gerais. A planned city founded in 1897, Belo Horizonte is the third largest in Brazil. In that city lived a gentleman named Mr. Arlindo Correa da Silva. He was born on June 2, 1910, in the city of Campina Grande in the state of Paraiba in northern Brazil. He studied at a Baptist college in Recife, the fourth largest city of Brazil and the capital of the contiguous state of Pernambuco. He was trained as an accountant, but chose to become a journalist in order to fight injustice, social abuse, and corruption in his country. At the age of 22 he moved to Belo Horizonte, joined the Spiritist church and started a journal named O Poder (The Power). In 1954, by the time he had married and was in his forties, he had a vision of Sri Ramakrishna. He had already read a French book on Sri Ramakrishna—L’ Enseignment de Ramakrishna [The Teachings of Ramakrishna]—and must have seen Sri Ramakrishna’s picture in it. Sri Ramakrishna said to him, “I am going to send one of my sons to you.” So saying, Sri Ramakrishna disappeared. Shortly thereafter he had another strange vision while bathing alone in a small pool in his home. A person arose from the water in front of him and said, “My name is Brahmananda; I am a disciple of Sri Ramakrishna. He has sent me to help you.” These visions took Arlindo totally by surprise. They also scared him. At that time Arlindo was associated with a well-known Spiritist teacher named Francisco Xavier, also called “Chico Xavier.” Arlindo described his visions to him, wanting to take his counsel. Chico Xavier reassured him and said, “Don’t be afraid, in the Gospels Jesus has said, ‘In my Father’s house there are many rooms.’” Arlindo understood that he must have entered another room of God’s house. All his fears disappeared. From then onwards Swami Brahmananda began to appear to Arlindo every now and then and give him guidance. Swami Brahmananda instructed Arlindo about what religious books to read and also asked him to serve the poor children of the city. Even a copy of The Gospel of Sri Ramakrishna came to him—an unexpected gift from a friend! In 1955 he started to care for children in his own home. Some of them lived with him; others went home at night to their families. Arlindo named his organization Missao Ramakrishna—Portuguese for Ramakrishna Mission. Eventually the organization was officially registered on February 6, 1959. Arlindo became its President and held that position until he passed away on June 20, 1993. As the number of children increased, Arlindo’s own house proved to be too small for Missao Ramakrishna. Professor Arlindo (as he came to be called) sold whatever he could and bought a fairly large piece of land at a low price in Betim, a small town 50 kilometers away from Belo Horizonte. Later another house was acquired in Belo Horizonte to be used as the headquarters of the Mission. Nowadays, however, the headquarters is located at the original home of Professor Arlindo. The building has been modified to suit the requirements of the headquarters. The first building of the Mission in Betim, constructed with the help of a bank loan, was inaugurated on March 31, 1960. The second building was built in 1961. At first there was a great scarcity of water on the Mission’s property in Betim. A firm was hired by the Mission to dig an artesian well. Several holes were dug, but they could not find any water. Then one day Swami Brahmananda appeared before Professor Arlindo in a vision, and pointing to a rocky spot on the property, said that water would be found there. Accordingly, digging was done on that particular spot and an abundant water supply was found. Later a second artesian well was dug, also following the instructions of Swami Brahmananda. All the water needs of the Mission are now adequately met by these two artesian wells. The Mission now has some fruit trees and a large vegetable garden, all irrigated by the water from these wells. The journal O Poder, once an organ of the Spiritist movement, now mainly spreads the teachings of Sri Ramakrishna, the Holy Mother Sarada Devi, Swami Vivekananda, Swami Brahmananda and other disciples of Sri Ramakrishna. The journal has a fairly wide circulation all over Brazil. To make the Mission financially self-sufficient, a small macaroni factory and a factory that manufactures wire netting were started. The products of these two businesses are in great demand in that rural area. Wire netting is used there for fencing properties, vegetable gardens, etc. There is a small workshop there to teach automobile mechanics, and a second workshop containing several handlooms that are used to instruct the women and children in how to produce various handloom products. When Swami Ritajananda (who was then the head of the Centre Vedantic Ramakrichna of Gretz, France) visited the Mission in March, 1992, he was surprised to hear a hymn that is very well known in South India, but being of a regional kind, is little known elsewhere. The children love to sing these hymns, and they often begin to sing spontaneously while they are doing their daily tasks, such as washing the dishes, sweeping the floor and even playing. Miracles do happen, even these days! And one of them has happened in the city of Belo Horizonte in Brazil. According to the latest reports from Missao Ramakrishna about 15,000 children have been given various kinds of help so far. In recognition of the excellent philanthropic work of the Mission, it has recently been awarded the prestigious Premio Itao/Unicef prize. My humble pranam and salutations at thy feet. Due to the nature of my work, I am sometimes compelled to travel out-of-home for several days. I’m happy to take confirmatory solace in the above article that it is “perfectly alright” to still perform daily japa in one’s bedroom, where no separate space is available for worship. With sincere love & prayers (from mum and dad as well). Yes, its true that travelling devotees find it hard to maintain the normal way of doing spiritual practices. But wherever you are, say in a hotel etc., just remember to place one aasanaa (seat) over the bed. It should be possible to carry one aasanaa with you. Please accept humble pranam at thy holy feet! I was really moved when I read the devotee’s plight with her in-laws. Your reply indicating that there is a purpose in getting into that family makes, on retrospective view some sense as the members of ‘that’ family who are opposed, would eventually turn to be devotees inspired by this devotee. The consolation is that our Lord is omnipotent, omniscient and omnipresent. Having said that, we can pray to the Lord to our hearts’ content wherever and whenever we want. Once again Swamiji, our heartfelt thanks for sharing such gems that make us ponder on the Greatness of our ever merciful Lord. Yes, sometimes it is heart-rending when one listens to initiated devotees about the non-supportive families. But beside the point that you have realised, it is the silent prayer to change the mind of the family members that do wonders. I was personally told by one elderly devotee of Revered Virajanandaji Maharaj (6th President of the Ramakrishna Order) when I was in Ranchi about how intense prayer can remove the problem in a smooth way though it entailed a very long time. That significant incident would be narrated in my blog some time later. It is quite clear that questions that are put out to the universe begets an answer! The dilemma that ‘Devotee A’ faces regarding time for spiritual practice is not uncommon to many women especially one like myself in the medical profession where time is not one’s own. Fitting in household duties as a married woman amongst non scheduled times makes the practice that I had, as an unmarried student, negligible. I can identify with the sense of guilt and also the worry of not accumulating good karma. It is very easy then to attribute every difficulty one is having to relate to the lack of intensity of practice as before = the consequence. All this even though rationally I believe in a non punitive Being. Steeped in religiosity as Hindu spiritual practice is, I do still fundamentally believe that whenever I find time to meditate in a non distracted manner, is acceptable. I often used to worry about the fact that my times could not match with the designated meditation times especially when I have to work through the night answering hospital calls and the disrupted sleep fatigued me. So instead of becoming a calming experience, I would be more stressed about not doing things properly. My job in looking after children allows me the blessing of reminding me of God but I have not been satisfied with just this believing I needed to be more strict with prayers at the correct time. It is gratifying to have some validation from a Guru such as you to know that the attempts I make are acceptable and that engaging in the thought of God albeit not typical Japa is Japa indeed. Thank you, Maharaj, for your encouragement always in my quest to realise the Divine within. You have indeed neatly elaborated the dilemma. It becomes quite stressful when there is not enough time in the day to complete daily duties. Working during the day and night as you often have to -being a medical practitioner,- causes great strain on the body and mind. Added to that feeling of ‘neglect’ when one cannot do japa and dhyana at the specified timings! However, the great solace is Prayer. For doing ‘praarthanaa‘ neither time nor place matters. Any time and in any position one can murmur within, pleading to ishta-devata to make you remember Him in all circumstances. Even if it means that you have to sit quietly in your office and contemplate on your Ishta, then so be it. But by this regular saadhanaa is never discounted. He who made you busy, will make you easy too! Leave everything in His hands! Be dependant on Him! He will show you the way. May our ever merciful Lord guide you in your spiritual quest! Please ask this devotee to pray to Sri RamaKrishna ONCE. Indeed I am happy the way you put it. It reminds me of the words of Rishi Vashishta who admonished his son for prescribing recital of Ram’s name three times, saying ONCE was enough! Yes, that devotee is a regular reader of this blog and she would definitely take to your suggestion. I do aspire to praying to Master all the time even though once is enough! The admonishment is accepted although I am grateful that my dilemmas go to Maharaj who has far more patience with us struggling devotees. Thank you for your gentle and patient guidance always! As a monk it is my responsibility to listen to the woes of devotees and give words of consolation. I cannot turn away any one who comes to me for solace and peace. So please note that nothing extraordinary is done but only what is expected of me…! 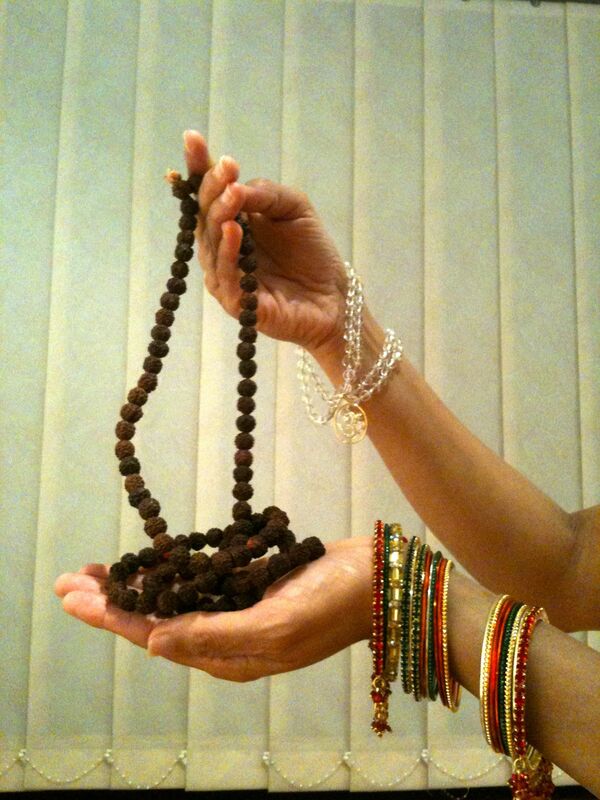 And during my prarthana time I do pray for all those individually and from then on, Master takes over!! I am only a postman!